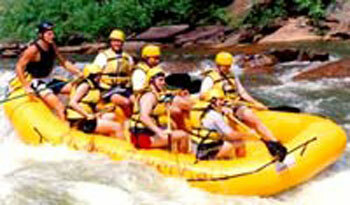 The Trishuli is Nepal’s most popular rafting river because of the easy access from Kathmandu and Pokhara. Fantastic scenery in a beautiful valley and impressive gorges with some exhilarating rapids along with easier sections as well as the right amount of time for a short trip, all make it the perfect trip for first-time or experienced rafters. The river’s popularity means that it is crowded at times and the beaches are disturbed during the normal rafting season.If you really want some fun during the monsoon months, the Trishuli changes character completely as huge runoffs makes the river swell and shear like an immense ribbon of churning ocean. When the river is running high and wild, there are hardly any rafters around and rafting the Trishuli is without doubt the most exciting thing you can do in Nepal during the monsoon, and just perhaps one of the best two days of big water rafting trips offered anywhere in the world. Rafting the Trishuli fits well into journeys to Pokhara,trekking the Annapurna region and a trip to Chitwan National Park.After a few hours driving from Kathmandu or Pokhara, it offers 1-3 days rafting with exciting rapids such as “Upset, Bijuli,, Lady’s Delight, Surprise.